An over-sized leader board banner placement at the top. Hmmm, I wonder what someone could do with that space, especially someone who has managed large commercial websites in the past? Action center in the right hand margin with a very pleasing contribute button at the top which dovetails nicely with the contribute link at the top right hand side. And then below the fold calendars and photos. Notice how the page doesn't endlessly scroll like other campaigns. Finally the choose your own version of the homepage that I've personally always liked especially when it is easy to choose like this one. Some critics won't like it, but I always like it when it isn't obtrusive (the one on NJO.com is annoying). OK, so what's the one thing wrong with the redesigned site? Simple. My son Jacob is no longer on the homepage which he graced for about a month (cute redhead holding the McCain sign on the bottom right). Come on Palmer, bring back Jacob to the homepage!!! Please tell me that was not an indirect compliment to palmer! Dear God it only took them a year to implement the EXACT things we told them to do...and they finally do it...and not all that well. It is EXTREMELY OVER Developed. Many great things are now in place and work well (mostly things the two of us suggested for months) but none the less...it is ultimately too much...too late..................typical of that particular group of staffers. Add that to the recent weeks of ineptitude from the campaign. Hopefully all of us 'unofficial' campaign folks keep growing and doing what we've been doing..because if not........My friend John is completely screwed. The new site is fine. I hope for peeps still on dial up that they can navigate. ; Brad Marston, one of the leaders of MV08 who started this, not on the roll. 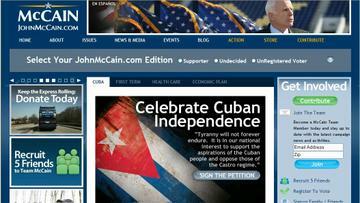 Pretty sad that those who have MADE John McCain's Internet Presence viable, are left out in the cold? not to mention we are the ONLY reason there are ANY positive search results for Mac, even his own website only shows up because of things (we) did. Not only that MAD but how many times did they (McCain campaign) come crying to us for help? I have a ton of e-mails on this, I know you do also. Guess these "staffers" are afraid that VOLUNTEERS are doing the job they are being paid for? ALL I want, like you and Brad & all our other 'Teammates' is for John McCain to be elected the 44th President of the United States! You don't know how right you are. I had a conversation with Kevin Scott a former candidate for US Senate. He said "I can be in the same room with these kind of people, but I try to take a shower as quickly as possible afterwards. The more successful you guys are, the less popular you'll be with the campaign staff." I would say that based on our current level of popularity we are doing a hell of a job! 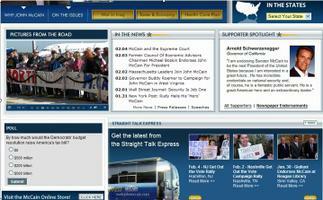 The site design is awesome and a far better version than the black/white version that first launched.